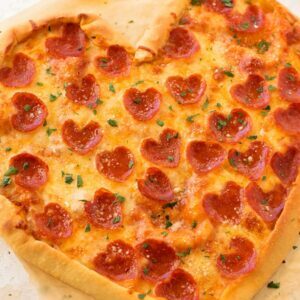 This Heart Shaped Pizza is a delicious homemade pizza that is perfect for Valentine's Day or special occasions. Preheat oven to 450 degrees. Line a pizza pan with parchment paper, set aside. Fold each pepperoni in half and cut into heart shapes using kitchen shears. Place on a paper towel lined plate and microwave for 15 seconds on high. Dab any excess grease off, set aside. Lightly flour a surface, roll dough into a heart shape, about 16 inches tall. Fold edges over and press to create the crust. Transfer pizza dough to prepared baking sheet. Brush with olive oil, then dock the crust with a fork to prevent bubbles from forming. Place in the oven and bake for 6 minutes. Remove and spread sauce over top, then add cheeses and pepperoni. Return to the oven and bake for 8-12 minutes or until the crust is golden brown and the pepperoni is crispy. Remove from the oven and top with fresh parsley or basil, if desired. Let stand for 5 minutes before cutting.